Students are the future thought and business leaders in society. They are a strong force of influence within the world of business. Therefore, understanding their attitudes towards societal trends and issues provide insight into how the future might shape up for China and its leaders. We discussed in previous posts the impact of coal burning and transport on China’s PM2.5 levels in cities. With this in mind, we wanted to gauge an understanding of how students from both China and abroad felt about this phenomenon and how it might affect their long-term stays. To achieve this, in September last year we conducted surveys with 107 students from the Shanghai Universities, Jiaotong, and Fudan. Here we present a few of our findings and explain the potential impact it could have on the individuals who represent the backbone of China’s future economy. Question 1: How long do you think it will be before the air pollution improves (in years)? Question 2: Do you think individuals can make a difference to air pollution? Question 3: Will you consider leaving China because of air pollution? With over 90% of students from China believing the current situation will not get better within 5 years, pessimism is widespread. 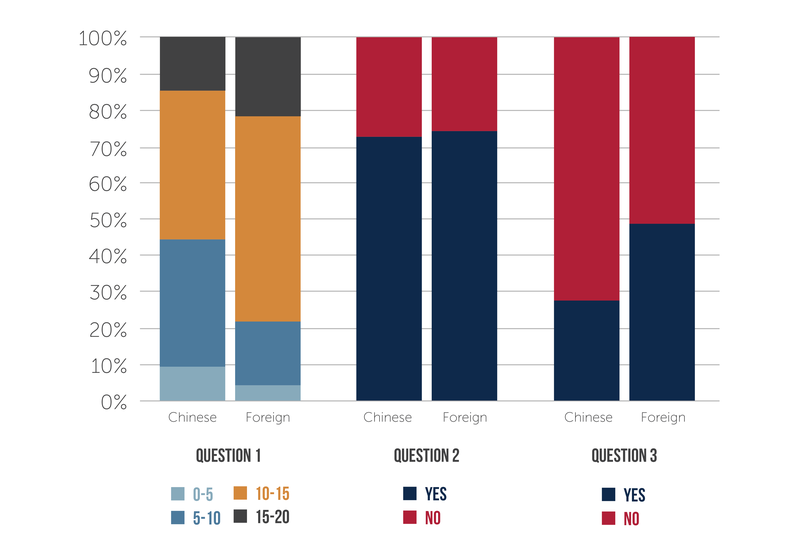 But in spite of this, a majority of students from both China and abroad feel confident in the individual’s ability to take action to limit their contribution to air pollution. Many claimed to “ride bike and use public transport” and whilst this is a common part of student life in Shanghai it is a good example of mobility that does not contribute negatively to air quality. Others claimed to actively engage in energy reduction techniques such as “turning off lights when not in use” and “limiting the use of air conditioners.” Whether this was environmentally motivated or not, was unclear, but it is no doubt a positive action. One of our core areas of interest was assessing whether students would leave China as a result of the air pollution. In this case, it was unsurprising to find that foreign students felt much more strongly about this with almost twice the percentage of people expressing that they would leave. One point of the interest, in this case, was that many opinions of Shanghai’s air quality were relative to students hometowns. Many expressed that Shanghai’s air pollution was “great” in comparison, whilst a girl from Hong Kong expressed disgust at the air quality claiming she “could taste it” and was desperate to return home. But with almost 30% of students claiming they would leave given the chance, the impact of air pollution on the brightest students in the country is clear – considerable numbers are ready to leave. Question: Would you be uncomfortable bringing up a child in Shanghai? 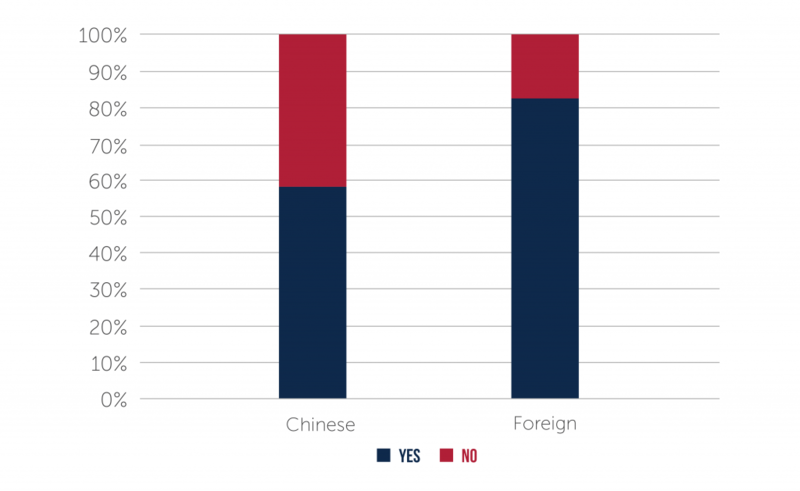 Despite a minority of Chinese students expressing they would leave China when asked the perhaps more poignant question of bringing up a child, many expressed a level of discomfort. Whilst there are a number of other factors that influence one’s decision to remain within a city or country it is interesting that bringing up a child, an ambition for many Chinese individuals, invoked much greater concern than leaving the city as an individual. Perhaps a greater insight into their long-term comfort within the city and country. So what does this mean for China’s future? Maybe not a huge amount, but it provides an indication of the best talents opinions towards the growing levels of air pollution. As citizens are afforded greater flexibility to travel and withdraw money from the Chinese economy, more may be plotting the lives elsewhere. Already we have seen an exodus as a result of pollution and given the responses received within our survey, greater migration could be on the horizon. Tags: air, migration, Pollution, students.